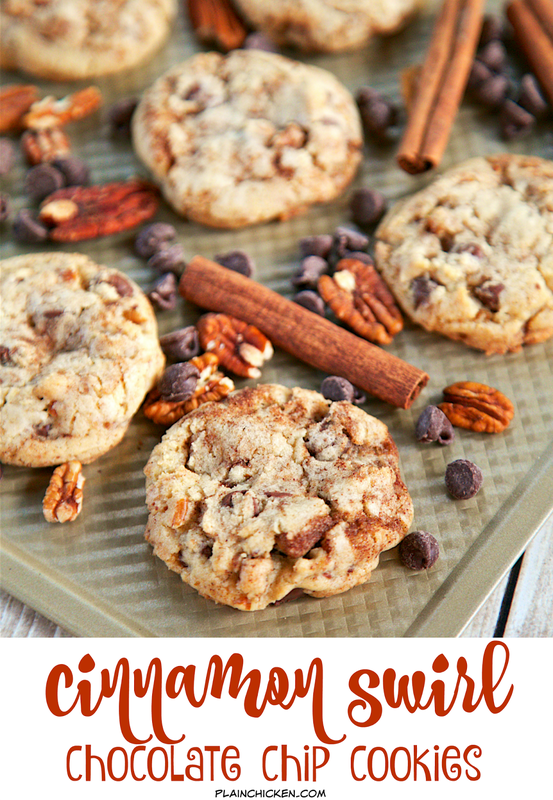 Cinnamon Swirl Chocolate Chip Cookies recipe - homemade chocolate chip cookies with a cinnamon swirl inside! SO delicious! Great for a cookie swap. Can scoop dough and freeze to bake later. One of my favorite things about the holidays is attending cookie swaps! I love sampling all the different cookies. I always overindulge at cookie swaps. The cookies are way too good to not eat them! OMG! I am dying by the end of the swap! 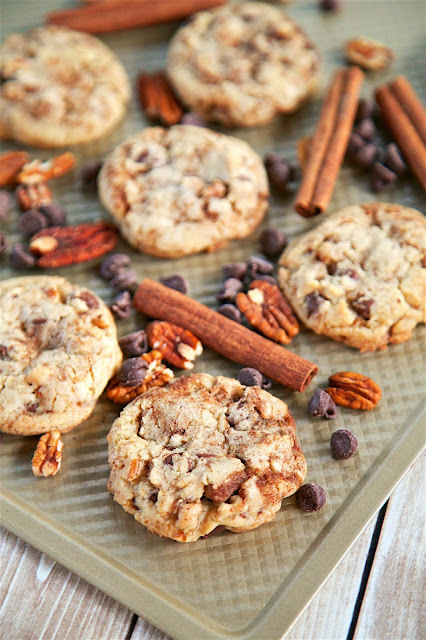 These Cinnamon Swirl Chocolate Chip Cookies are perfect for any upcoming cookie swaps. The recipe makes about 4 dozen cookies.You can make the dough and freeze scoops of dough until you are ready to bake them. I love to freeze cookie dough! Chicken Legs loves to pull out scoops of dough and bake them for a midnight snack. He is our resident cookie monster. These cookies are SO delicious! 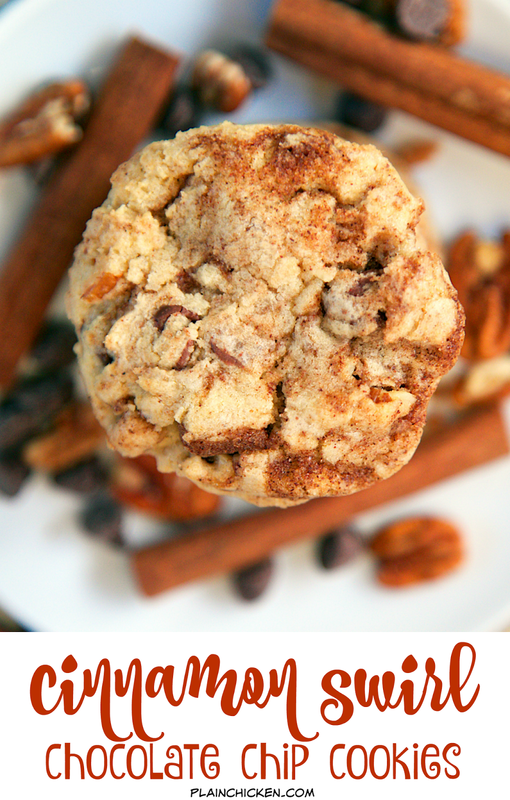 We absolutely loved these cinnamon swirl in the cookie. YUM! We ate way too many of these! They are a fun twist to our usual chocolate chip cookies. Make some today! If you are feeling generous, share them with family and friends! In the bowl of an electric mixer, beat 1 cup butter, granulated sugar and 1 cup brown sugar on medium speed until light and fluffy, about 3 to 4 minutes. Add eggs and vanilla; beat until incorporated. Whisk together flour, baking soda, salt and baking powder. Gradually add to butter mixture; beat just until combined. Stir in chocolate chips and pecans. Combine 1/2 cup brown sugar, 2 Tbsp butter and cinnamon. Drop mixture by spoonfuls over dough. Gently swirl through. Bake for 12-14 minutes. Let cool on wire rack. 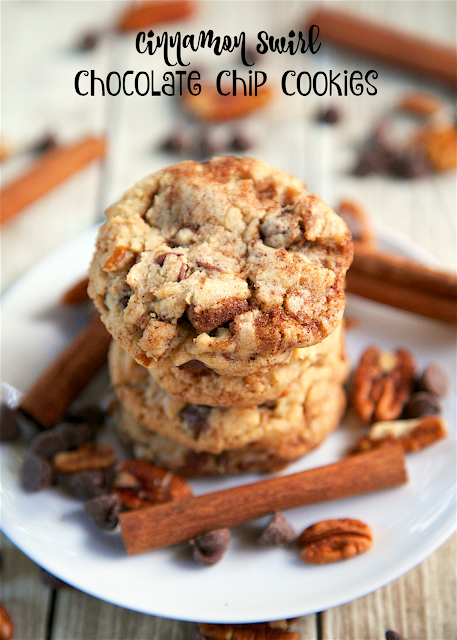 What a great twist on a classic chocolate chip! Yumm! 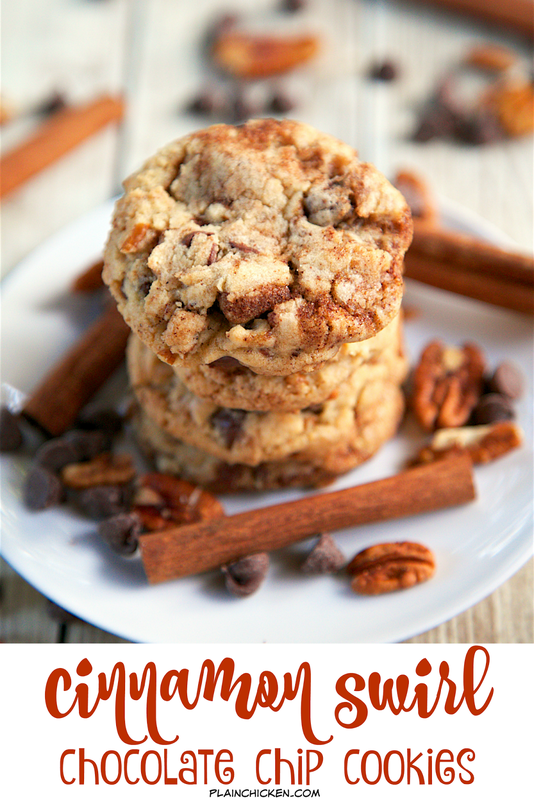 Mmmm these look delicious and I wish they would appear at my cookie swaps!